IRVINE, CA--(Marketwired - Dec 12, 2013) - RealtyTrac Network (RTN) announced today that it has delivered more than 550 million consumer media impressions, according to media tracking site Marketwired, for its broker members and their brands one year after signing its first broker. The average number of media impressions for each brokerage company member exceeded 80 million impressions over the same period, for an estimated publicity value totaling more than $5 million for RTN. A media impression is defined as a person who has viewed a piece of media content including online, newspapers, television and radio. Since RTN's establishment in December 2012, the start-up network has selected just eight brokerage companies to license and provide feedback on the various aspects of its diverse and exclusive broker offering. 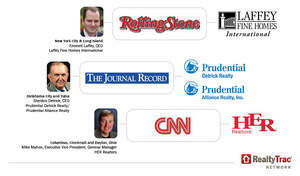 The media coverage achieved through the network relationship -- or the MediaTrac portion of the offering -- represents only one part of the company's diverse broker network offering. "We have been very selective of the brokers we license in RTN," said Jamie Moyle, CEO of RealtyTrac. "Our intention was to refine the offering over the past 12 months and then aggressively launch the next phase of our growth in early 2014. That plan is on track and we are ready to expand the availability of the offering to many more markets and brokerage companies in the coming year." RealtyTrac has been in business since 1996 and has grown to become the industry's most comprehensive source of housing information. With the onset of the distressed housing market, RealtyTrac worked to distill all of its housing data into content and information that continues to be used by media and consumers alike. "Our effort to include local broker content is an integral part of accurately documenting the evolving U.S. housing market, and we are now able to enrich our extensive housing data reports with local market input contributed by our broker members across the country," added Moyle. "With RealtyTrac's current media reach of more than 100 billion consumer impressions per year, it's clear we are able to offer even more expansive media opportunities for our broker members to capitalize on in the coming year." The RealtyTrac Network is a licensed network that provides leading residential real estate brokerages with a means to align with a proven, forward-thinking, online strategic business leader. Licenses in the network are awarded on an exclusive basis in each market, and are available to both franchised and independent brokerage companies. Those interested in applying for an exclusive RTN license may visit http://www.realtytrac.com/network and submit an inquiry. RealtyTrac (www.realtytrac.com) is the nation's leading source for comprehensive housing data, with more than 1.5 million active default, foreclosure auction and bank-owned properties, and more than 1 million active for-sale listings on its website, which also provides essential housing information for more than 100 million homes nationwide. This information includes property characteristics, tax assessor records, bankruptcy status and sales history, along with 20 categories of key housing-related facts provided by RealtyTrac's wholly-owned subsidiary, Homefacts®. RealtyTrac's foreclosure reports and other housing data are relied on by the Federal Reserve, U.S. Treasury Department, HUD, numerous state housing and banking departments, investment funds as well as millions of real estate professionals and consumers, to help evaluate housing trends and make informed decisions about real estate.